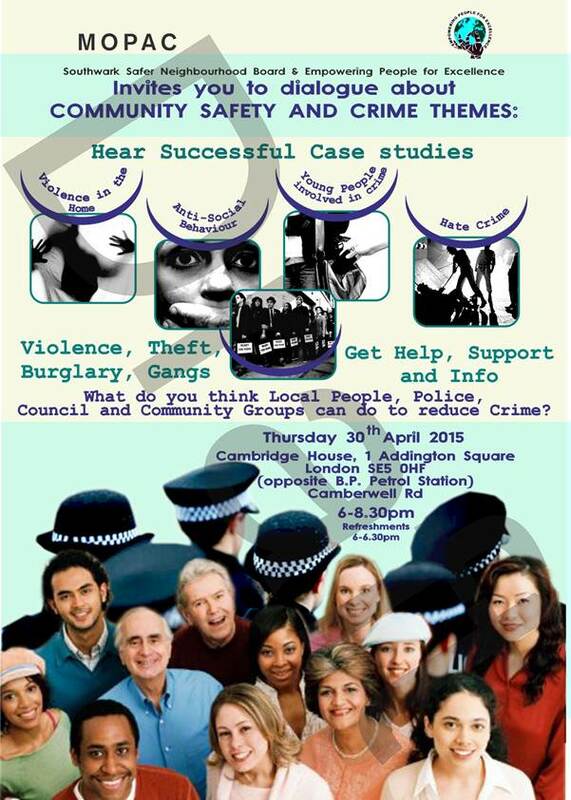 Everyone is invited to a dialogue about community safety and crime in our borough on Thursday 30th April 6-8.30pm at Cambridge House, 1 Addington Square, SE5. See flyer. This is arranged by the Southwark Safer Neighbourhood Board which is led by community representatives. The Board members are representatives of local community groups, the Council, police and other relevant public service bodies. They meet regularly to discuss policing, crime and community safety. They also have a small budget to support community projects that address key issues for the borough. This event is part of one such project. If you have any interest in these topics and/or the role of the community in contributing to the solutions, this would be a good meeting to go to. A lot of people don’t vote in elections because they feel there is no real difference between the political parties, or that none of them represent our views or that the whole system is not in a good state or for other reasons. But it was a long hard struggle over centuries to win the right to vote. In many parts of the world, some still can’t vote and some die for it. So it is really important to vote to keep our democracy alive. And you can do that NOW without voting for …anyone, and getting that vote counted! All you have to do is write on the ballot ‘none of them’. This deliberate action creates a ‘spoilt’ vote. All spoilt ballot papers are counted and published. If the number of spoilt papers increases significantly, it sends a message that things need to change, and the elected candidate should find new ways to link with and work with constituents between elections. On 7th May, vote for your preferred candidates or party. But if they are not your choice, vote for ‘none of them’. Let’s all vote for democracy! As well as exercising your vote in the forthcoming election, you can support the NOTA campaign: http://nota-uk.org. NOTA campaigns for an official ‘none of the above’ choice on the ballot paper in future. Increasing the numbers of deliberate spoilt papers now will support the NOTA campaign. 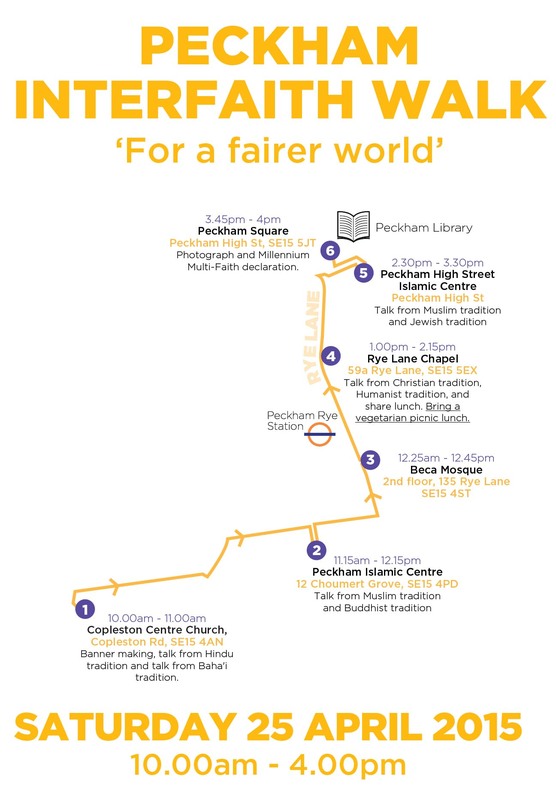 Our next inter faith walk will be on Saturday 25th April in Peckham town centre from 10am to 4pm. You can join and leave when you need to – see the attached maps with approx times for the different stages of the walk. (http://www.peckhamvision.org/wiki/Inter_faith) we had an interesting look at our town centre from this different perspective. Do come and join us if you can. These give important details about Network Rail’s plans for the platform lifts, and Landolt & Brown’s ideas for the building on the corner of Blenheim Grove and Rye Lane, and the locations for public toilets. Also explains the complicated links between Platform 3 support and the Arcade building. Definitely worth taking a look at their short summary and some of the slides. Meeting: WED 8th APRIL 6.30pm – 9pm. think about them, if they are good for our neighbourhood, and whose neighbourhood is it anyway?